The Lok Sabha polls 2019 are being held in seven-phases for 543 seats on April 11, April 18, April 23, April 29, May 6, May 12 and May 19, and counting will be on May 23. Lok Sabha election: The second phase of the Lok Sabha election 2019 will be held across 96 constituencies in 13 states on Thursday. As per the Election Commission, all arrangements have been done to ensure free and fair elections. Crucial states that'll go to polls on Thursday are Tamil Nadu (38 Lok Sabha seats), Karnataka (14), Maharashtra (10) and Uttar Pradesh (8). 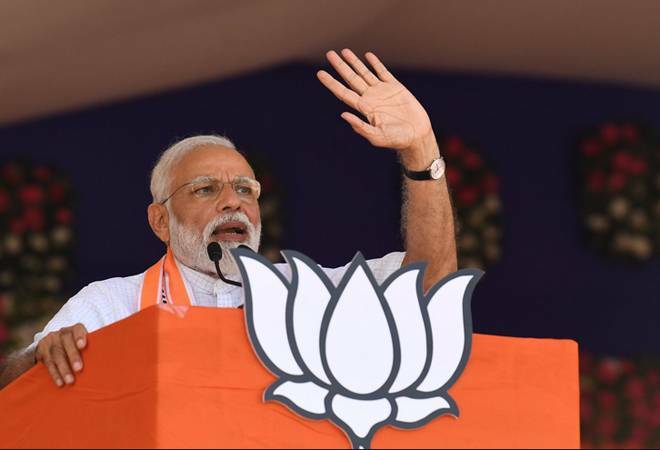 Prime Minister Narendra Modi during his public rally in Madha, Maharashtra, today hit out at the Congress, saying those sitting in AC rooms of Delhi and keeping a tab on things don't know the ground reality. Congress President Rahul Gandhi, who is visiting the Wayanad constituency in Kerala today, told people: "I'm not here to tell you my 'Mann ki baat', I'm here to understand what is inside your heart, your soul." Here are all the live updates of the Lok Sabha polls 2019. 1.45pm: Punjab Minister Navjot Singh Sidhu in Ahmedabad, Gujarat: "Arrey Narendra Modi yeh rashtrabhakti hai tumhari ki pet khali hai aur yoga karaya ja raha hai, Baba Ramdev hi bana do sabko." 1.15pm: "Here is another confirmation that lakhs of jobs were lost after demonetisation. Azim Premji University has reported that 50 lakh jobs were lost in two years after demonetisation. PM claims there is no unemployment in India. This is the problem if the PM will fly around the world but will not drive on the roads of India or walk on the streets of small towns and villages," says former finance minister P Chidambaram. PM claims there is no unemployment in India. This is the problem if the PM will fly around the world but will not drive on the roads of India or walk on the streets of small towns and villages. 12.50pm: Congress President Rahul Gandhi during his Wayanad rally says: "I've not come here as a politician who is going to tell you what to do or what I think. I'm not here to tell you my 'Mann ki baat', I'm here to understand what is inside your heart, your soul." 12.45pm: Sadhvi Pragya Singh Thakur says she has formally joined the BJP. She is also meeting senior BJP leaders Shivraj Singh Chouhan, Ramlal, and Prabhat Jha. 12.29pm: Rahul Gandhi attends the Coordination meeting of three parliamentary constituencies, including Kannur, Kasaragod and Vadakara, in Kerala. CP @RahulGandhi attends Coordination meeting of three parliamentary constituencies of Kannur, Kasaragod & Vadakara. 11.50am: Congress President Rahul Gandhi visits a temple in Wayanad. He reportedly performed rituals for his grandmother, father, forefathers and victims of the Pulwama incident. 11.40am: "This is happening after a long time when people of the country are canvassing to bring back the government to power," says PM Modi. 11.36am: "Those who sit in air-conditioning rooms in Delhi do not know the truth of the Earth," says the PM. 11.35am: Prime Minister Narendra Modi during his election rally in Madha, Maharashtra, says officials have been directed to ensure all possible help for the victims of storm in Maharashtra, Gujarat, and some other states. 11.15am: Lucknow team of UP STF has arrested two people and seized illegal weapons, cash and SIM cards from them. 11.01pm: Congress President Rahul Gandhi offers prayer at the Thirunelli temple in Wayanad, Kerala. 10.54am: The Election Commission has announced postponement of polling in the Tripura (East) Lok Sabha seat to the third phase on April 23 from April 18, saying the prevailing law and order situation there is not conducive for holding free and fair polls. 10.38am: PM on Mahaveer Jayanti: "Bhagwan Mahavir is a shining beacon of a tradition whose exemplary teachings have furthered the spirit of peace, harmony, brotherhood and non-violence." Congress President Rahul Gandhi also greeted people on the occasion. 10.36am: The Lok Sabha election to the Vellore constituency in Tamil Nadu has been cancelled by the Election Commission (EC) two days ahead of the polling following recovery of huge amount of cash allegedly from an associate of a DMK leader recently. Vellore candidate AC Shanmugam has now decided to move the Madras High Court against EC's decision. 10.15am: Defence Minister Nirmala Sitharaman tells ANI: "I got to know that he (Shashi Tharoor) injured himself while performing some ritual(in Trivandrum)so I thought I should go and wish him well." 10am: PM Modi will address four rallies today. 9.30am: "Around 1 crore people have benefitted under the PM Rozgar Protsahan Yojana. If crores of jobs are being created in a sector which only constitutes 15% of the total jobs, then imagine what the total number of jobs being created is," says PM Modi during an interview with The New Indian Express. 9am: "Even the fugitives who were able to run away are now in jails and are making rounds of courts in foreign countries. We're taking all legal steps to ensure that such fugitives are held accountable for their misdeeds," says Prime Minister Narendra Modi.